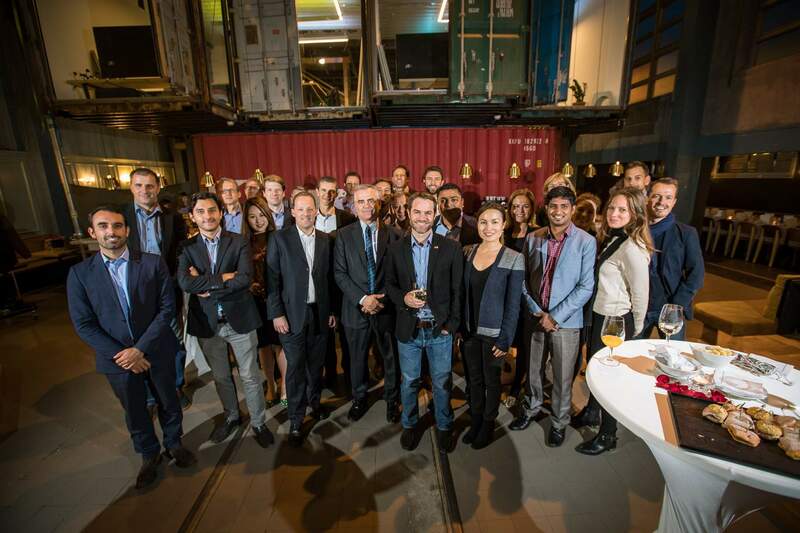 Thomas Gottstein, CEO of Credit Suisse (Switzerland) Ltd. (5th person from the left) together with Anke Bridge, Head of Digital Solutions & Delivery Credit Suisse (Switzerland) Ltd. (2nd row, 3rd person from the right) joined the Kickstart Accelerator Startups at the EWZ Selnau Kraftwerk startup work space for a CEO-meets-founder dinner. as well as over a century of experience in the industry. "There is a lot we can learn from startups as a bank, and vice versa. Startups are often able to address client needs very precisely with specific solutions as they can focus and look deeply into isolated areas of the value chain. As a bank, we need to learn from that to provide more client-focused offerings. On the other hand, Credit Suisse has a full breadth of banking products that covers the entire value chain as well as over a century of experience in the industry. Therefore, it is a win-win partnership for both parties," mentioned Anke Bridge, Head of Digital Solutions & Delivery, Credit Suisse (Switzerland) Ltd.
"We have had several engagements and projects with large companies back in Korea. Swiss corporations tend to be more open to innovative ideas and more willing to collaborate with startups," says Alison Shim, Head of Strategy. Blocko is a South Korean startup that focuses on providing B2B enterprise solution. The startup helps improve process efficiency and security. One of their product modules is identity management and authentication. The financial industry can benefit from their products to provide highly secure and easy-to-use authentication methods to their clients. Today, Blocko's product is already implemented with large South Korean banks as well as the stock exchange. They have gained strong traction in the banking space in Korea achieving 78 percent market share and are now looking for expansion into Europe. "The Kickstart Accelerator provides an excellent platform to listen to the needs of large international corporations. It was exceptionally helpful to have these companies open up and share their pain points with us as well." 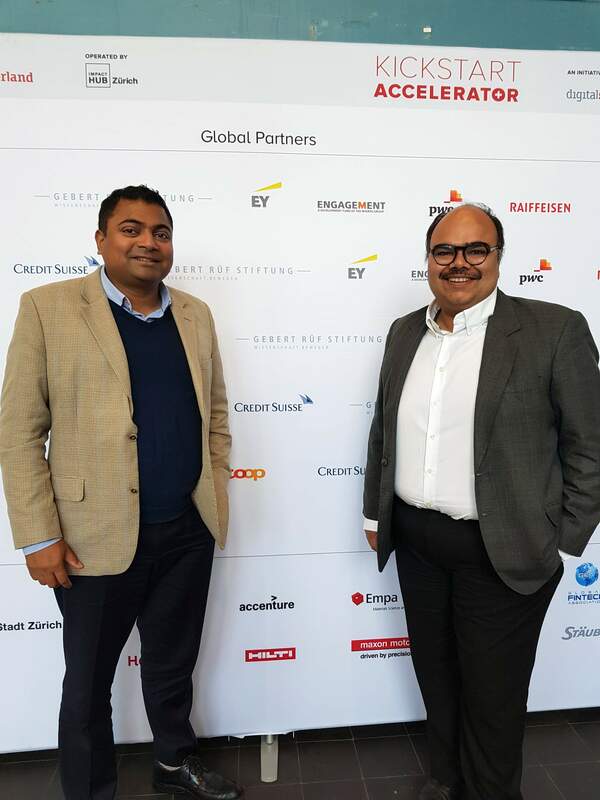 Havell Rodrigues, Co-founder and CEO of distributed ledger startup Adjoint, felt that "The corporate sponsorship line-up was one of the most attractive aspects of the accelerator. " Adjoint's platform is based on highly intelligence programming language that enables traders and financiers to create, verify and execute smart contracts with predictable the outcome. It can be used to structure, execute and process transactions tied to complex financial instruments such as structured products, OTC derivatives, collateralized loans, etc. This enables banks to increase revenue potential, lower processing costs and improve risk management. Adjoint was established in 2016 based in London. They are considering a base in Switzerland to more actively collaborate with the Swiss financial industry ecosystem. "Our goal is to help enterprises innovate using disruptive technology," said Somil Goyal, COO of Adjoint. "We help banks identify how to improve margins, increase revenue potential, lower costs and reduce risks. Vice versa, these financial institutions have a broad customer base, the regulatory framework and infrastructure that Adjoint can benefit from." Another startup at the Kickstart Accelerator 2017 is Libryo. "Legal departments in the financial industry face three major challenges: Firstly, knowing all the laws applicable in any situation. Secondly, keeping up with constantly changing laws, and thirdly, finding the right information quickly," says Malcolm Gray, Co-Founder, Chief Financial Officer and Chief Client Officer of Libryo. Libryo provides a cloud-based software that enables all employees within an organization to understand their legal obligations in any situations. The vision of the company is to bring simplicity to the complex world of regulatory environment by making laws accessible to all. With a library of laws processed with big data analytics and trained with machine learning, Libryo can provide enterprises with a simple-to-use tool to understand employee exposure to legal obligations. This can be a very useful tool for banks to ensure employee compliance. Libryo was established in the UK and has a large commercial presence in the South African market. For more information about the other seven exciting Fintech startups not featured in this article, please visit the Kickstart Accelerator webpage.